34 of the 35 arrestees are black; all of them have been charged with the exact same criminal offences despite the lack of evidence of their individual participation in demonstrations. April 16, 2016. 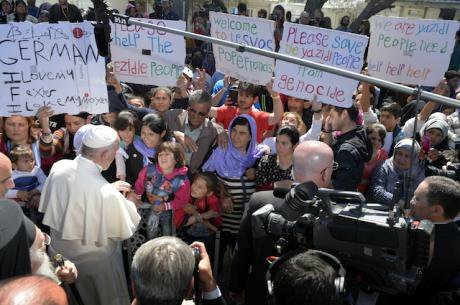 Pope Francis,accompanied by Orthodox Patriarch Bartholomew, Archbishop Ieronymos, and Greek PM Alexis Tsipras, spend five hours meeting migrants at the Moria refugee camp on the Greek island of Lesbos. ABACA/press Association. All rights reserved.On July 18, 2017, 35 migrants were arbitrarily arrested after a series of protests outside the European Asylum Support Office, organized from inside the Moria detention center. Coming from different parts of the world but trapped under the same circumstances, many people united and mobilized to denounce both the unlawful delays in their asylum applications and the appalling conditions under which they’ve been forced to live in the meantime. 34 of the 35 arrestees are black; all of them have been charged with the exact same criminal offences despite the lack of evidence of their individual participation during the demonstrations. One of the accused was hospitalized for over a week as a consequence of police brutality, four faced restrictive residency on the island, and the remaining 30 were scattered across Chios, Athens, Attica, and Central Greece where they have been – and will continue to be – detained until the day of their trial. After nine months of waiting, it has been decided that the trial will take place on April 20, in the Mixed Jury Court of Chios. This particular case should not be taken as an isolated event but as existing within the larger repressive framework of the Greek state and the EU’s anti-migration policies. International agreements, such as the EU-Turkey deal, promote the externalization of borders in order to keep migrants from reaching European territory – turning the islands into prisons where they are to be contained in a state of limbo. As a result of this containment policy, the hotspots on the islands have become unbearably overcrowded, but lack the necessary infrastructure to provide the most basic needs. Trapping people for extensive periods of time under these inhumane conditions is not only a systematic violation of human rights, but also goes against the laws and supposed values of Greece and the European Union. This is precisely what the protesters were addressing on the day of the arrests. They demanded that the authorities comply with the right to live a dignified life. They demanded that the authorities comply with their own rules. This routine infringement of human rights, and the overall abusive treatment of migrants perpetuated by anti-migration policies, are epitomized in this particular court case. Systematic injustice pervades every level, starting with the oppressive displays of power used by local police forces and continued by every other branch of the state. The violent raids on July 18 led to 35 arbitrary arrests by means of excessive force and racial profiling. Police forces targeted the ‘African section’ of the Moria camp, where they assaulted and arrested people at random– or rather, solely because of their placement within the camp. However, this wrongful course of action was legitimized by the exaggerated charges brought against the arrestees, and further upheld by their disproportionate sentences. The consequences that each person now faces include not only imprisonment but probable deportation to the countries from which they originally escaped. This escalation of their punishment – which does not fit the crime – aligns with the general ploy to criminalize migrants in an attempt to justify their exclusion from the right to international protection. Furthermore, the defendants were deliberately separated in a way that interfered with the preparation of their defence, not to mention the fact that several of the arrestees were deprived of adequate translators during this procedure. For nine months they’ve been held under punitive pre-trial detention, inevitably evoking a sense of isolation and lack of support for every individual. Finally, the location of their trial was transferred to Chios – yet another institutional effort to undermine the case, limiting the access to favorable witnesses and testimonies. Taken altogether, the clear consistency of the state’s actions reveals a unanimous policy of intimidation and fear –i ntended to dismantle and further prevent self-organized movements by refugees. It becomes very evident that their strategy is to silence refugees and migrants in order to hide the cruel reality of the islands. A reality which is not only enabled but actually endorsed by both the European Union and Greek state through these very practices of violence, racism, and blatant inhumanity. So how is it possible for this overt disregard of basic human rights to be carried out by law enforcement officials? The degrading treatment that these 35 men have endured since their arrival to Europe exposes a clear categorization of first and second class people. This division is based solely on which side of the border you are from. In other words, the nature of your encounter with Fortress Europe is predetermined by your nationality. Africans are at the bottom of this list. The administrative rhetoric that attempts to normalize this biased criteria only exposes its deep-seated racism. Thus, for as long as they’ve been under the European border regime, the 35 detainees have experienced a revolving door of built-in discrimination, exemplified by the automatic denial of their right to seek asylum on the basis of nationality. To reiterate this rejection and dissuade others from coming, they’re contained in what could easily be mistaken for a prison, and expected to wait for longer than some actual criminal sentences. This discourse of intolerance used by the EU deliberately blurs the line between detention centers and prisons, victims and criminals. The more blurred the line, the easier it can be crossed. So, how is this possible? It is only possible because every stage of this case has been immersed in the deeps roots of racism that pervades all levels of the state and the European Union. Given the degree of institutional racism throughout, we cannot expect the same administration to come up with a fair verdict in the Court. These 35 men will be legally assessed by a law that’s foreign to them, in a language that’s foreign to them, at the hands of the same authorities who put them there in the first place. Those who discriminated against them, criminalized them, and have imprisoned them. The immoral management of the Moria case is only possible because of the false construction of refugees and migrants as second class people, which dispossesses them of their fundamental rights. Would this have happened if they were European? We do not trust the authorities to be fair and impartial on April 20. The only chance for these 35 men relies on making much more visible the injustices they’re facing. These injustices must not be overlooked, despite the state’s efforts to silence refugees and hide their realities. Silence means that the problem does not exist; that racism is in the past. Their story contradicts this cover-up. Their existence is resistance. Only resistance will defeat the silence.